Day 1: Fly to Axum and transfer to hotel, full day city tour. O/ n hotel. Day 2: Fly to Lalibela and visit to the rock hewn churches. O/ n hotel. Day 3: Fly to Addis Ababa and city tour; Evening departure. Day 1: Fly to Axum and city tour. O/ n hotel..
Day 2: Fly to Lalibela, and then proceed to visiting the rock hewn churches. O/ n hotel. Day 3: Fly to Gondar and visit castles compound, Debre Birhan Silassie church, and Emperor Fasilades bath. O/ n hotel. Day 4: Fly to Addis Ababa; city tour and shopping; Night departure. Day 1: Fly to Bahir dar; visit the Blue Nile falls and in the afternoon visit Lake Tana Island Monasteries. O/ n hotel. 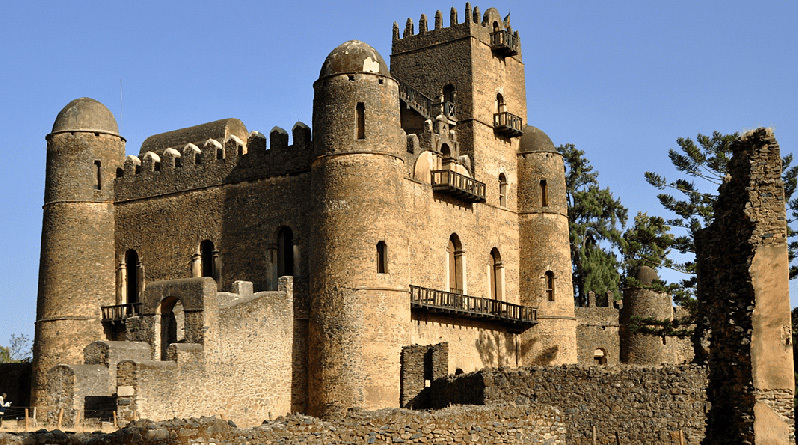 Day 2: Fly to by drive to Gondar and visit the castles compound, Debre Birhan silassie church and Emperor Fasilades bath, Falasha village, Qusquam church. O/ n hotel. Day 3: Fly to Lalibela and full day tour the rock hewn churches. O/ n hotel. Day4: Fly to Axum; city tour. O/ n hotel. Day5: Fly back to Addis and city tour; Evening departure. Day 1: Arrive to Addis Ababa and transfer to hotel. O/ n hotel. Day 2: Drive to kombolcha on the way sees scenery, the people culture (If the day is Sunday on the way you will visit the Senbet open air market). Day 3: Drive to lalibela en route visit to Haik Stefano’s monastery. O/ n hotel Lalibela. Day 4: Early morning excursion to Yihmrhana Kirstos church; afternoon visit the first group of Lalibela churches. O/ n hotel. Day 5: A.M visit to Asheton Mari am semi- monolithic church by mule/ trek; P.M visit to the rest Lalibela churches. O/ n hotel. Day 6: Drive to Gondar via Debre tabor. O/ n hotel. 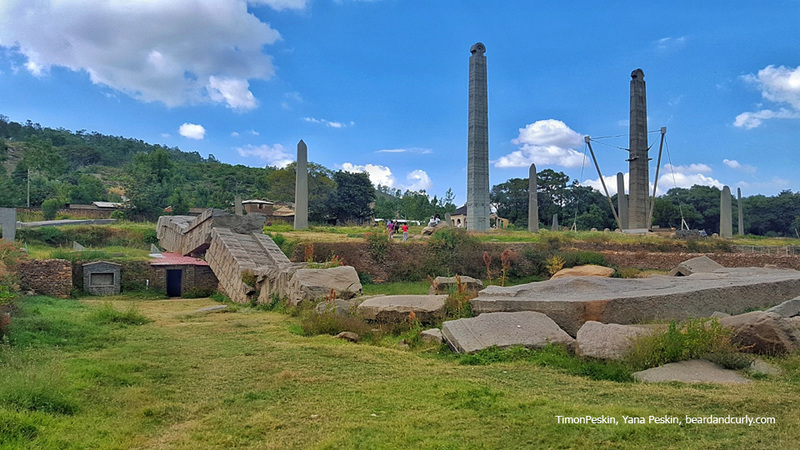 Day 7: A.M visit the castles compound, Debre Brihan sillassie church and Emperor Fasilades bath where the annual Timket (Epiphany) conducted; P.M drive to Bahir dar. O/ n hotel. Day 8: A.M drive to see the Blue Nile falls; P.M Boat trip on the Lake Tana Monasteries. O/n hotel. Day 9: Drive back to Addis Ababa en route sees the Blue Nile gorge and the Debre Libanons monastery (13th c). O/ n hotel. Day 10: City tour in Addis and dinner in traditional restaurant with folkloristic dances. Then transfer to airport for departure. Day 1:Arrive Addis Ababa, welcome ceremony and transfer to hotel. O/ n hotel. 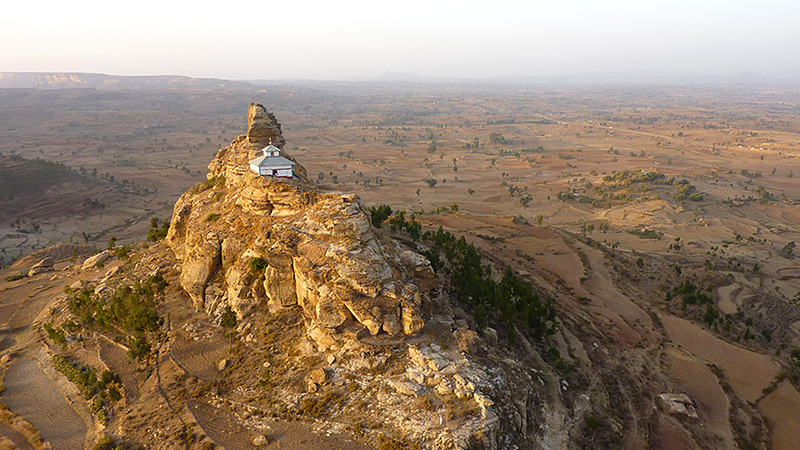 Day 2: Drive to Bahir dar on the way visit the Debre Libanons monastery, Blue Nile Gorge. O/ n hotel. Day 3: A.M excursion to Blue Nile falls, P.M boat trip Lake Tana. O/ n hotel. Day 4: Drive to Gondar and visit the castle compound, Fasilades bath and Debre Birhan silassie church, Falasha village. O/ n hotel. Day 5: Drive to Axum via western part of Siemen Mountains (the best scenery) and Tekezze gorge. O/ n hotel. Day 6: Full day city tour in Axum. O/ n hotel. Day 7: Drive to Mekelle en route visit yeha temple (500 B.C), Tigray rock hewn Churches like Abrha we Atsebha and wukro kirkos. O/ n hotel. Day 8: Drive to lalibela via Sekota. O/ n hotel. Day 9: Full day visit the 11 rock hewn churches of Lalibela. O/ n hotel. Day 10: Drive to kombolcha. O/ n hotel. Day 11; Drive back to Addis Ababa and shopping; Evening departure. Day2: A.M excursion to Blue Nile falls, P.M boat trip Lake Tana. O/ n hotel. 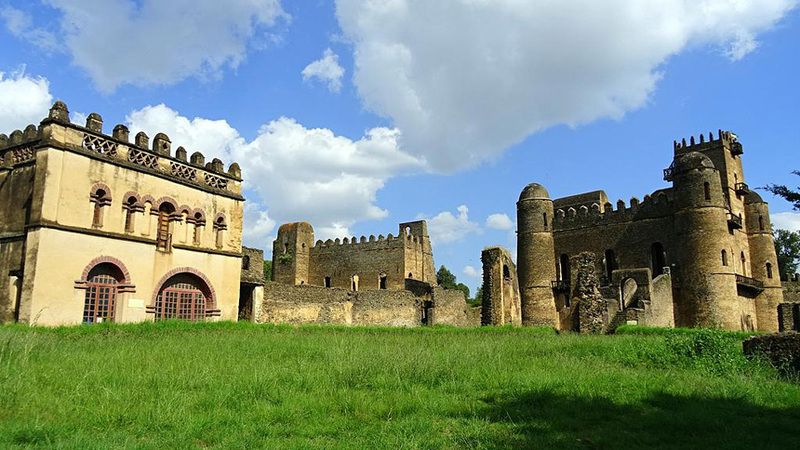 Day 3: Drive to Gondar and visit the castle compound, Fasilades bath and Debre Birhan silassie church, Falasha village. O/ n hotel. 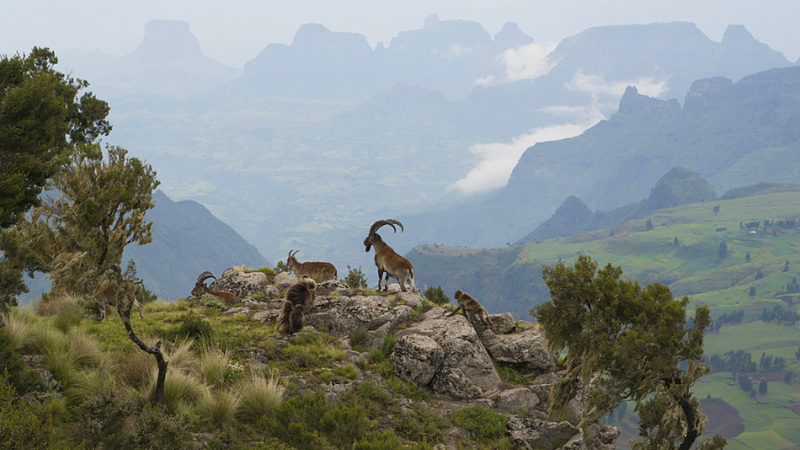 Day 4: Drive to Siemen mountains national park, for spectacular views and chance to see the endemic animals of Ethiopia like siemen fox, Chaldea Baboon, Walia ibex, lammergeyer, other many birds. O/ n camping cheneck. Day 7: Drive to Mekelle en route visit yeha temple (500 B.C), Tigray rock hewn Churches like Abrha we Atsebha and wukro kirkos. O/ n hotel.Day8Drive to lalibela via Sekota. O/ n hotel. Day 11: Drive back to Addis Ababa; Evening departure. Sites: Lalibela, Debre Damo, Yeha, Axum, Siemen mountains national park, Gondar, Bahir dar and Addis Ababa. Day 1: Arrival, welcome ceremony and transfer to hotel. O/ n hotel. Day 2: Drive to Dessie on the way visit (If the day is Sunday; the Senbet open air market) and scenery. O/ n hotel. Day 3: Drive to Lalibela. O/ n hotel. Day 4: A.M excursion to Asheton Mariam semi- monolithic churches by mule, P.M visits the first group churches of lalibela. O /n hotel. Day 5: Early morning drive to Yimrahhana Kirstos/ Nakutoleab churches, afternoon tour the 2nd group of churches of Lalibela. O/ n hotel. Day 6: Drive to Mekelle through Sekota to cross spectacular views. Day 7: Drive to Axum en route visit Debre Damo monastery and yeha. O/ n hotel. Day 8: Full day tour Axum. O/ n hotel. Day 9: Drive to Debark, and then proceed to siemen mts. National park. O/ n hotel or Camping. Day 10: Game viewing and trekking in the park. (It is special place for spectacular Scenery). O/ n camping. Day 11: Drive to Gondar, afternoon tour the city. O/ n hotel. Day12: Drive to Bahir dar, and then proceed to Blue Nile falls and P.M visit the Lake Tana Island monasteries. O/ n hotel. Day 13: Drive to Addis Ababa and invited dinner at traditional restaurant with folkloristic dances. O/ n hotel. Day 14: City tour in Addis Ababa and evening departure. Day 1:Arrival Addis Ababa, welcome ceremony and transfer to hotel. O/ n hotel. Day 2: Fly to Axum and full day tour Axum. O/ n hotel. Day 3: Fly to Lalibela, visit the 1st group churches and P.M tour Nakutoleab/ Yihmrahhana Kirstos churches. O/ n hotel. Day 4: A.M excursion to Asheton Mari am church by mule, afternoon visit the 2nd Group of Lalibela churches. O/ n hotel. Day 5: Fly to Gondar and tour the city. O/ n hotel. Day 6: Drive to Bahirdar, A.M visit the Blue Nile falls and P.M boat trip on the Lake Tana to see monasteries dot there. O/ n hotel. Day 7: Fly to Addis Ababa and city tour; Evening departure. Day 1: Fly to Bahirdar and tour the whole day in the Blue Nile Falls and the Monasteries of Lake Tana islands. O/ n hotel. Day 2: Drive to Gondar and visit the Castle compound, Debre Brihan Silassie church, Qusquam Mari am church and Fasilades bath. O/ n hotel. 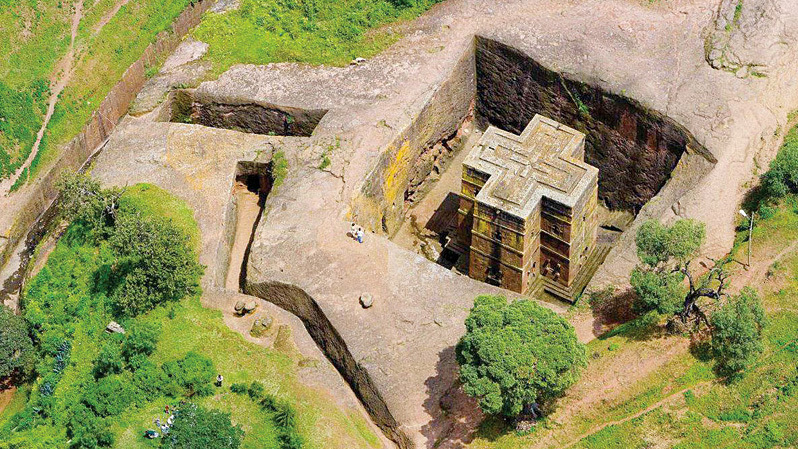 Day 3: Fly to Lalibela; tour the 11 rock hewn churches of Lalibela. O/ n hotel. Day 4: Fly to Axum and city tour. O/ n hotel. Day 5: Fly to Addis Ababa and city tour. O/ n hotel. Day 6: Fly to Diredawa; then proceed to Harar and visit the Juogal wall, museums,Traditional Adere peoples home, Arthur Rimbaud poet house and evening Hyena men performance (anywhere else could happen except in Harar in the world). O/ n hotel. Day 1: Arrive Addis Ababa, welcome ceremony at the airport; transfer to your hotel. O/ n hotel. 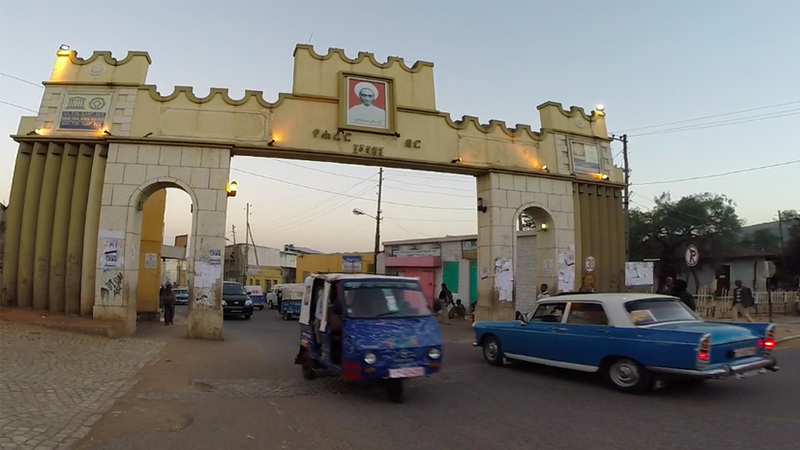 Day 2: Fly to Dire Dawa, meet by our representative then drive to Harar, afternoon city a tour of Harar. O/ n hotel. Day 3: Morning visit Babile, the valley of marvels; PM Harar’s mosques, churches, French poet Rimbaud house, market, Adere people cultural houses; evening watch hyena men performance. O/ n hotel. Day 4: Drive to Dire Dawa and fly back to Addis Ababa.O/ n hotel. Day 5: Full day city tour, night departure. Day 1: Arrive at Addis Ababa, transfer to hotel. O/ n hotel. 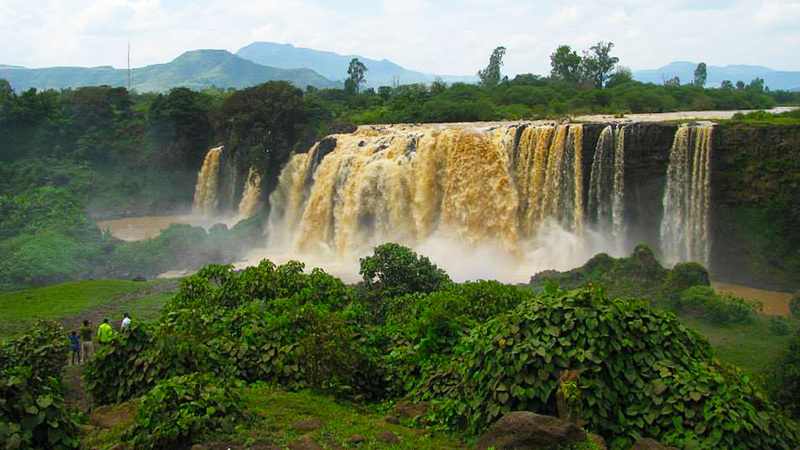 Day 2: Drive to Bahirdar, while driving visit the Debre Libanons monastery and Blue Nile gorge. O/ n hotel. Day 3: Morning tour to Blue Nile Falls; afternoon tour of the market, the papyrus Boat productions, and view over Lake Tana and the Nile River from Bezaawit Palace. O/ n hotel. Day 4: Tour on Lake Tana to admire the monasteries over its island; afternoon lunch drive to Gondar. O/ n hotel. Day 5: Tour of Gondar; the castle compound, Fasilades bath, Debre Birhan Silassie (Light of Trinity), Qusquam church and Falasha village. O/ n hotel. Day 6; Drive to Siemen mountains national park, for spectacular views and chance to see the endemic animals of Ethiopia like siemen fox, Chaldea Baboon, Walia ibex, lammergeyer, other many birds. O/ n camping cheneck. Day 7: Drive other side of Siemen Mountains to Axum. O/ n hotel. Day 8: Tour Axum; visit the steale, St. Mary of Zion, tomb, inscriptions, palaces and Museum. O/ n hotel. Day 9: Drive to Yeha the pre- Christian temple, Debre Damo monastery and Wukro Kirkos. O/ n lodge. 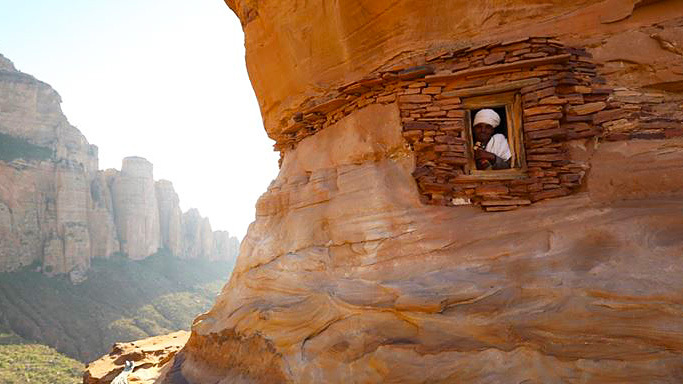 Day 10: Full day Tigray churches tour; Abreha we Atsbeha, Degum selassie, Mariam Korkor and Daniel Korkor. O/ n hotel. Day 11: Drive Lalibela crossing spectacular views. O/ n hotel. Day 12: Full day tour the 11 rock hewn churches. O/ n hotel. Day 13: Morning by mules visit semi- monolithic church of Asheton Mariam; afternoon drive to visit the cave church of Nakutolaeab. O/ n hotel. Day 14: Drive to Kmbolcha; en route visit Lake Hayik. O/ n hotel. Day 15: Drive back to Addis Ababa on the way visit Bati where Afar and Oromo people market at senbte village if it is Monday. Farewell dinner at traditional restaurant with folkloristic dances at Addis Ababa; Then departure. We will customize tours as per your budget and timeline.